Edible medical marijuana made its Illinois debut Saturday, ending a wait for patients who prefer eating to inhaling. CHICAGO -- Edible medical marijuana made its Illinois debut Saturday, ending a wait for patients who prefer eating to inhaling. To some, cannabis-infused foods seem milder than smoke or vapor, but the products carry their own risks. It takes longer to feel the effects when marijuana is eaten, so it's easy to eat too much with unpleasant - or even dangerous - results. "As exciting as bringing edibles to market is, we want to make sure that every patient takes small portions, and wait at least an hour before taking more, until you understand and get comfortable with consuming medical cannabis in its edible forms," said Ross Morreale, owner of Ataraxia, an Illinois company with marijuana chocolates hitting the market. Under the state's pilot program, edible products must be manufactured by licensed cultivation centers, the same businesses growing cannabis in locked indoor facilities. 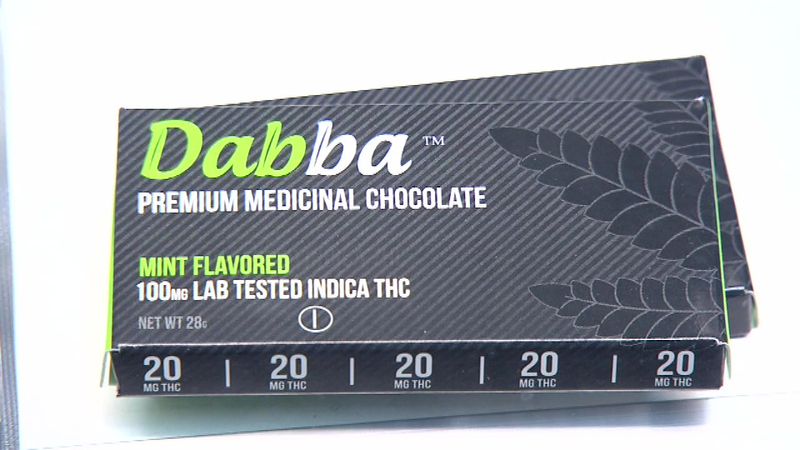 Ataraxia shipped marijuana chocolates to two dispensaries, which will start selling them Saturday, Morreale said. The square-inch chocolates contain 10 milligrams of THC, marijuana's leading active ingredient, and come in three flavors: milk chocolate, dark chocolate and white chocolate-raspberry. They'll be priced at $7 to $9 per square. "We taste it blank so it has a good flavor foundation," Ataraxia chef Joseph Pierro said. "We have not tasted it with the (cannabis) oil, but we're confident flavor will be there strong and true." Regulated pot sales began Nov. 9 in Illinois, but companies didn't have edibles ready until now. Other cultivation centers reached by The Associated Press said they will ship edibles starting in January or February. Dispensaries are required to provide information about the various forms and methods of cannabis administration, and possible side effects. The Illinois Department of Public Health is drafting guidance for patients regarding edible forms of cannabis and will distribute shortly, state officials said. The state already requires warnings on the products, meant to distinguish them from regular candy and food. In Colorado, the state responded to the 2014 death of a college student who jumped from a hotel balcony after eating a potent marijuana cookie by reducing the amount of THC allowed in a serving. Dispensaries and advocates there have spread cautionary messages including "Start Low, Go Slow." Sarah Wright, 61, of Rock Falls, uses medical marijuana for fibromyalgia and looks forward to edibles. "I worry about the mailman coming and smelling it," Wright said. "You smoke it and smell it all through the house. That gets old."